Day 1 featured a tough choice for serious infrastructure geeks – a field trip to one of the following destinations: 1. US Army Corps of Engineers Bay Model, 2. Zanker Municipal Landfill + Debris Processing, 3. SSF Secondary Wastewater Treatment Plant, 4. Polaris/Eagle Rock Levin-Richmond Terminal, 5. 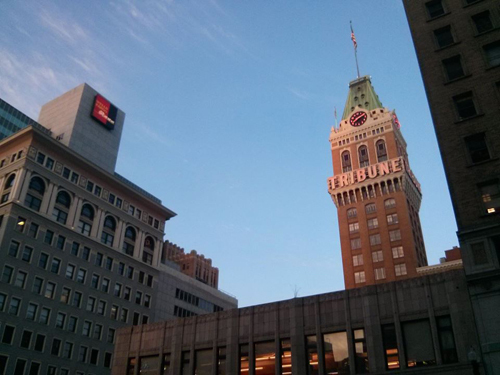 Oakland Tribune Tower, 6. Surveillance History Walk and 7. OruKayak-ing. The Tribune Tower tour was a real treat, hosted by John Law (co-founder of the Cacophony Society and Burning Man). The tower itself is an amazing structure with a rich history of near-abandonment and renewal, its clocks and neon signs maintained by Law who, in a unique arrangement, swaps his services for an amazing office space toward the top of the structure. The group got to go all the way to the top, winding up ladders, squeezing past the water tower and elevator machinery, and ultimately poking out onto a crow’s nest of sorts at the base of the flagpole on top of a steeply-sloped roof. But the tour was only half of the fun – sitting down with Law for lunch and drinks afterward turned into a great conversation. Did you know that he engaged in games of capture the flag across malls using mannequins? Or that his crew of urban explorers had little climbing training but built their own building-infiltrating rope ladders to compensate? Or that he, too, is fascinated with Kowloon Walled City and Temporary Autonomous Zones? No? Well, now you do. With just a few speakers to start things out, the first evening gave a taste of the broad spectrum of talks and panels yet to come. Local-focused Isaiah Saxon highlighting clever DIY infrastructure at community scales and global-oriented Alex Steffan considering the broader implications of (un)sustainable urban development practices for the present and future of our globalized planet. Day 2 showcased an array of of panelists and presenters that showed just how many fields and endeavors can be found (or fit) under the umbrella of ‘infrastructure’, starting with Rick Prelinger’s brief (but compelling and anecdote-filled) history of the telephone. Did you know that early copper phone wired were left uncovered and one-line-per-house, making it almost impossible to make a call on most San Francisco mornings until the fog blew off? Brendan Koerner tackled the history of airport security, from rampant 1970s skyjackings (heading to Cuba, anyone?) to other factors that set the stage for our current state of affairs with the TSA. Todd Lappin talked third, discussing the military history of the Bay Area and how much the city’s park system evolved from having prime real estate set aside for bases and other governmental purposes. But I digress. Panelists throughout the day gave short talks, some of which perhaps ran a little longer than intended, cutting short the discussion portion for better or worse. Either way, they provided engaging interludes to the longer presentations sprinkled in throughout the day – their limited duration also helped many of them feel quite focused. The full list of speakers and panelists can be found here, and really speaks to the depth and breadth of experience and knowledge that came together for this event. Landscape architects, data visualizers, dam builders, historians of technology and more from backgrounds including (but not limited to) the MIT Urban Risk Lab, Studio-X, Building Robotics, Bionic Landscape and the Institute for the Future. Geoff Manaugh and Nicola Twilley flew in from New York to give some closing thoughts on the event. They talked a bit about their wonderful travels vis-à-vis Venue, touched on the global state of refrigeration (have we built our own dispersed arctic, a global frozen foodscape, ironically warming the planet in the process?) and helped put everything discussed in a larger context. That was the end, but how did it start? Organizers Tim Hwang and Xiaowei Wang were looking for an excuse to visit local infrastructure – something to make them seem more official. The next thing you know they are throwing an amazing event and sparking great over-beer conversations afterward. Beyond that, a personal highlight: a long lunch with Roman Mars two days after the event. For those who don’t know, Roman runs 99% Invisible, easily the best radio show on design. It was great to learn about what he is working on these days in general, what he wishes he were working on and what others wish he were working on. All in all, a great behind-the-scenes look at how radio works (and differs from other forms of publishing with which I am more familiar). Oh, and the food was excellent, too.